After a rejuvenating facial service, it is customary for many spas to offer makeup consultation and application. This service can be offered complimentary or designated by its own pricing menu. Applying and recommending the right makeup on a client boosts their self-esteem, ultimately boosting the spa’s bottom line. Eye cosmetics, in particular, can not only produce a dramatic look on the client but also provide a lucrative retail opportunity for the spa. This article suggests a fresh approach to “thinking in threes” by basing your suggestions on their eye, skin and hair color. This approach provides your clients with a personalized approach based on their unique characteristics, which makes shopping for makeup at your spa a different experience than at the makeup counter. The goal is to get your clients comfortable playing with colors. When you guide them through learning something new, you will create a bond with your clients. Clients will start to lean on you to show them new trends, techniques and products that might be a good fit for them. This relationship can be deeply personal and meaningful to both parties and will secure a long-term relationship. Here are some tips for using the science of color to provide eye makeup suggestions to your clients when thinking in threes. The first step of this process is determining how clients care for their eyes. One of the biggest causes of under-eye wrinkles are traces of makeup left behind due to improper eye makeup removal. Ask your clients to explain their eye care process. Recommend an eye makeup remover that works well for their needs. Waterproof mascara or mineral makeup, for example, need a different type of remover to break them down. Next, tackle eyelid discoloration as necessary. Ask if they have oily, normal or dry eyelids in addition to determining if they have discoloration issues. Use this information to recommend the appropriate eyelid primer. If their eyelids are reddish, choose a beige primer with green undertones to conceal redness. If their eyelids are purplish, go with a yellow- based eyelid primer. If eyelids are transparent or look bluish, opt for a peach-toned eyelid primer. The same color rules for choosing primer apply in choosing concealer. However, choosing the right formula is important. Consider your client’s skin type under her eyes (crepey, dry, bumpy, thin, etc.). Finding a great concealer for your client is a sure way to have her stay loyal to your product line. The idea with eye shadow, eye liner and mascara is to use color that makes the natural eye color pop. Start by assessing their eye color. Do this by staring into the colored part of their iris and note the dominant color. This can be somewhat tricky since there are many different colors prevalent in the iris; however, take note of which eye color is the most dominant. Next, determine the complementary color for eye shadow. Complementary color means the opposite color on a color wheel (See Color Wheel). Pulling out a color wheel from your makeup counter makes an impression on the client. Teach the client as you make a color choice for them. Blue eyes. Blue eyes are considered cool-toned, and the complimentary color to blue on the color wheel is orange. Straight orange is fine for the adventurous client, but most will opt for warmer shades, such as coral, peach, champagne or a warm brown. Light, warm or neutral warm tones best complement cool blue eyes. Pair the warm shadow choice with a black-brown mascara and a chocolate eyeliner pencil to complete the look. Gray eyes. This eye color can be daunting because the secondary color must be used, since gray is mostly considered neutral. If the eyes are gray-blue, subtle peaches, rich bronzes and coppery shades are the best since orange is the complementary shade for blue. For gray-green eyes, red is the complementary color, so choose from the violet-red family, such as orchid, lilac or plum. For brown or hazel-gray eyes, turn to shades that are the complement of brown eyes, such as purples, plums or steel blues. True gray looks great with a monochromatic color scheme, such as steely gray, silver, charcoal or a silvery pearl. Complement the look with a charcoal black mascara and a colored eyeliner that is in the same family as the shadows, just deeper in value. Green eyes. Green eyes look great with red-violet eye shadow. Green eyes are naturally bright, so you don’t have to rely on vivid shadows and liners to attract attention. Lilac is the perfect pop for a night out, and a red-brown, like wine or burgundy color, is just enough color during the day. Avoid black mascara, since it might be too harsh. Opt for dark brown mascara with a plum eyeliner to really make their green eyes pop. Hazel eyes. If a client’s eyes are hazel—which is a blend of brown, yellow, and green—look deep into her iris to find the dominant hue. If she has mostly gold flecks, the complementary shade would be purple, so choose plums. If the flecks are mostly green, the complementary shade is red, so opt for burgundy. 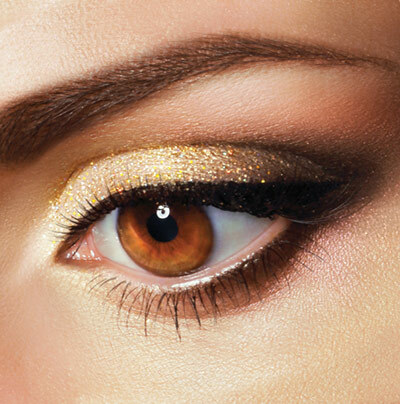 If the flecks are more brownish with little green or yellow, choose metallics like gold, silver and pewter to make the brown in the eyes sparkle. Black mascara is the go-to color, but colored mascara and colored eye pencils can be a fun way for clients to tiptoe into being more adventurous with color. Brown eyes. Brown-eyed clients are lucky, because they look amazing in any color other than the exact brown shade of the eye. Brown incorporates all of the colors on the color wheel, so choosing a complementary shade is easy. Salmon and gold are gorgeous. The key with brown eyes is having enough color intensity, which is why brown eyes look good with rich pigment and smoky hues. Darker brown eyes look larger when applying violet or silver eyeshadows, as they provide contrast to the warm of the brown. Brown eyes can pull off black liner on the waterline as well, since it matches the brown eye intensity. Black mascara or navy mascara is sure to get her brown eyes noticed. 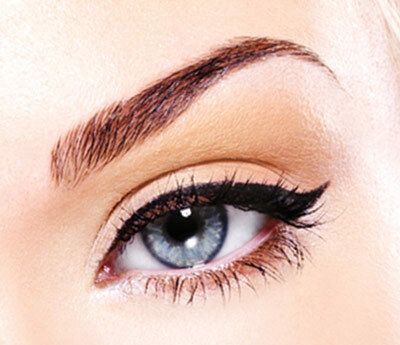 Choosing the right brow product should be based on the client’s skillset and the right formula for her hair type. Sparse brows might need a pencil, gappy brows need a brow wax and fuller brows need a tinted brow gel to keep hair in place. Depending on the product chosen, teach clients the correct application in a “less is more” technique using their facial measurements to determine the right brow style and shape. 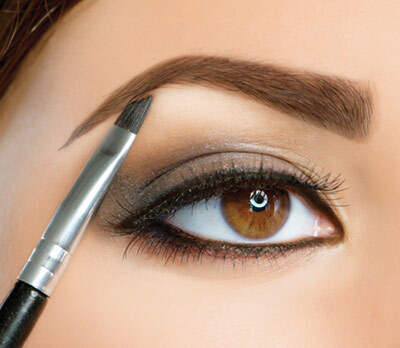 One of the most important choices for brows is the shade. The best rule of thumb when choosing brow color is to select a shade that is two shades lighter for brunettes and darker for blondes. A taupe with a red undertone looks nice on redheads, and a brown with red undertones works great on darker auburns. For silver haired clients, choose a soft, cool taupe for their brows, since straight gray can look harsh. This personalized approach to “thinking in threes” will make clients feel cared for, prompting them to share their experience with friends and family. Invite your clients to take pictures with their phone while in your spa and post them on social media, tagging your business. It is great exposure and a great way to attract clients to visit you for makeup lessons. 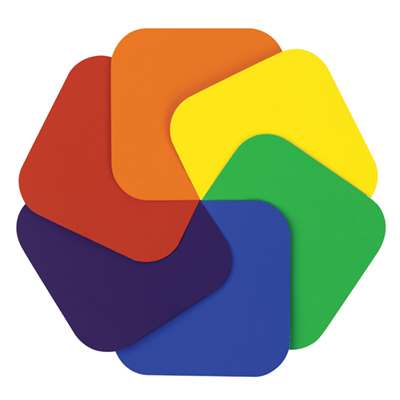 Using a color wheel is a fun tool to introduce the science of color to your clients. It helps them understand the art of makeup application, and they can learn it from you. Creating events at your location focusing on their eyes and sending out a newsletter highlighting “the magic of color” or a “how to transform your eyes” might be a great way to get additional traffic through your door. As a licensed beauty expert, you are well-equipped to show clients how powerful their eyes can be when enhanced with color. 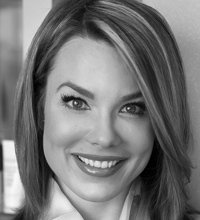 Jaclyn Peresetsky is an esthetician and owner of Skin Perfect Spa. She is known as the go-to expert in the greater Columbus, Ohio, area for microcurrent treatments, custom blend makeup, eyebrow design, color theory and custom skin care. She is also the author of “The Power of Your Colors,” and she is working on her second book, “The Journey to Perfect Skin.” She also has a patent-pending color identification system created to better identify unique color characteristics for choosing makeup.